As ever, there’s no straightforward answer. It’s like trying to boil an egg to exactly how you like it. It can be down to a number of factors such as whether the water was boiling before you put the egg in, how big the egg is, the heat of the stove or even the size of the pot. The fact that hobbies and other passion-led industries such as arts, music, and sports score highest is pretty easy to understand. They are giving their subscribers what they want and love. This brings me to the first strategy to increase your open rates. In order to keep your subscribers opening your emails, you need to give them what they want. Aside from offering free stuff, this means delivering quality content. Brand Awareness – Informative, interesting and engaging content helps to raise the awareness of your brand. The more time people spend looking at your emails, the more they will recognize you. Keep Subscribers Informed – Emails are a great way to inform your subscribers what is happening in the company or industry and can trigger a purchase. Content Is Shareable – If you produce excellent content, then your subscribers are more likely to share it, potentially boosting your subscriber list and email open rate. It is a challenge to produce consistently good content for emails, so you should consider how many emails you send. To state the obvious, an engaging and relevant weekly email will have a higher open rate than a poorly written daily email simply promoting products. Another factor is to ensure your content is optimized for mobile devices. This goes right from the subject line to the content of the email itself. If mobile users are unable to view the email properly the first time, it is unlikely they will ever open another one. Download our FREE PDF with 9 great tips to create awesome mobile friendly emails! Here’s a startling stat: 21% of permission based emails never make it to the inbox. In the US, the average is even higher at 24%. The survey from Return Path underlines the importance of ensuring your email meets the criteria to avoid spam filters. Don’t use deceptive headers such as “from names” or subject lines. Always provide an unsubscribe link and ensure it is working for 30 days after being sent out. You must include a physical mailing address. These are the basics and it is always worth looking into the document if you are unsure. If you’re outside the United States, check for similar pieces of legislation. If you fail to meet these criteria, then you are likely to end up in the spam folder anyway, never mind potentially facing a court date. 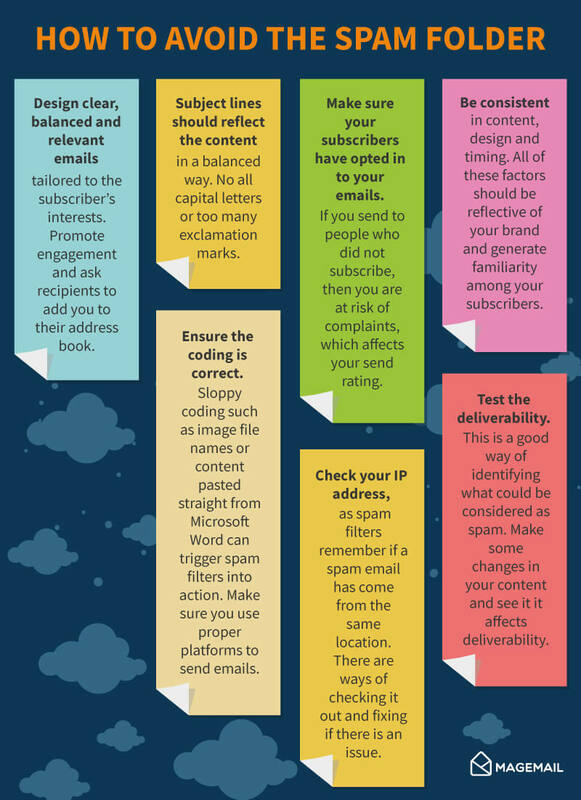 Follow these steps, and your emails will end up in the subscriber’s inbox and not spam. This is one of the simpler tricks to boost your email open rate, yet often overlooked. Emails sent to segmented lists generate 58% of all revenue from email marketing, compared to 14% for unsegmented sends. If you have a list of 10,000 subscribers, it is highly unlikely they all share the same interests and needs. So it makes sense to break the list down into smaller segments. These are just some of the suggestions. You know your market so segment your subscribers to suit your industry. Any professional digital marketer will find a way. With the average office worker receiving 121 emails a day, it is crucial to make sure you can time your email so subscribers see it before it gets buried in the inbox. The perfect spot depends on a number of factors such as industry, the nature of the email and the lifestyle of your subscribers. Countless surveys suggest that Tuesdays and Thursdays are the most effective days for open rates, with Wednesday not far behind. In terms of time, around 11 a.m. scores very highly as does 8 p.m. to 11 p.m. when people are checking emails at home. However, I would recommend you do your own testing. This is the only way you can find your sweet spot on the email schedule. For example, if you are promoting a special offer at a bar on Friday night, then 2 – 3 p.m. on a Friday afternoon to a younger crowd in the area would be a perfect time. 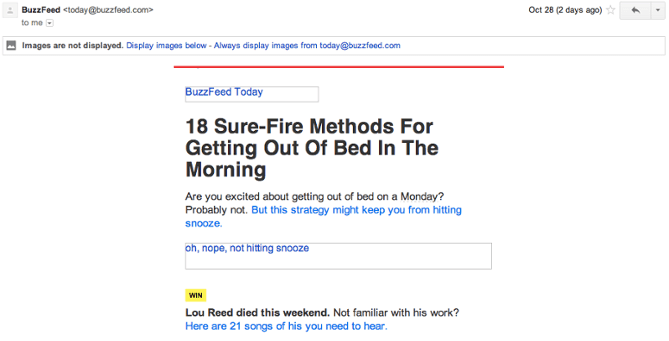 Another good example is from Buzzfeed who time their 18 Sure-Fire Methods on Getting Out of Bed in the Morning email on… Monday morning. Perfect. If you are a start-up or a new business looking to get going, it will be tempting to “buy” an email list. There are plenty of websites offering this service and promising great results. Resist the urge and play the long game. 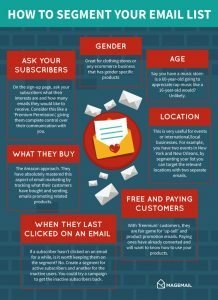 Purchased email lists damage your sender reputation, potentially lead your emails to being blocked by Email Service Providers (ESPs) and won’t actually bring any revenue to your business. What you want is a list of subscribers who willingly signed up to your emails. Incentivize visitors on your website to subscribe. You can do this by putting a “gate” on a page with meaty, high-quality content or offer introductory discounts in return for an email address. Scroll-triggered pop-ups, such as those offered by our GrooveJar toolset, are becoming an increasingly popular tool. They pop up once a reader has read 70-80% of the selected page, meaning they are clearly interested in what you have to say. Ensure this only pops up once per visit and never for people who already signed up. Competitions are a great way to gain subscribers. To enter, people will need to put in their details. The possibility of a great prize creates a good impression of your brand too. Utilize social media sign ups. See those quick and easy sign-up options through Facebook and Google? They have been very efficient in boosting email lists because they offer all the information you need at the click of a mouse. Google and Facebook will possess more information on your clients than you ever likely will. Utilize this for both your own and your subscribers’ benefit. Set up a preference center where your potential customers can choose their interests and the number of emails they receive from you. This will manage expectations and ensure your subscribers get the content they want. The more you can grow your list organically and tailor it to interested subscribers, the more you will see your open rate climb. A more engaged list is a more profitable one. But it is an important part of keeping those open rates up. And it takes more than just a name. The whole email strategy needs to be thought out with the subscribers in mind. As I suggested earlier, is someone living in Australia likely to be interested in an event in New York? No. This is personalization at work: going beyond a name and into your subscribers’ interests, hobbies, location and more. This is a fantastic example of a personalized email from JetBlue. But here’s the interesting thing: Did they mention my name once? But did it feel like it was talking to me and about our “relationship” together? Absolutely. They even remembered the time I deleted them. They designed the content as if it was talking to an individual (i.e. me), and used words like “you” or “we”. The thing is, this is not an individual email but rather a trigger email sent to specific segments, which we talked about earlier. Without segmentation, it is nearly impossible to personalize emails beyond the name of the subscriber. This underlines its importance in email marketing. The power of personalization is illustrated by Experian’s findings that state personalized emails lead to 600% higher transaction rates than non-personalized emails. There is no doubt about it. Making emails personal secures high open rates and boosts your ROI. According to the Litmus State of Email 2017 Report, 54% of emails are opened for the first time on mobile devices. That’s right, more emails are being opened on smartphones or tablets than desktop or laptop computers. It is more important than ever to ensure your emails are formatted to mobile devices. If a subscriber opens their email on their smartphone and it looks untidy, it leaves a poor reflection on your brand, and they probably won’t bother opening it on their computer. More alarmingly, they will probably ignore all future emails from your brand. Focus on ensuring your email can be read with equal ease on both desktops and mobile. It’ll be worth it. So, you’ve put all this work into creating an amazing email. It’s personal, has high-quality content and you’ve even formatted it for both mobile and desktops. Look at the subject line. Does it engage, inform and excite? Is it short and balanced? All that work, gone. You’ve lost the subscriber before you even got going. In some ways, the subject line is more important than the email itself, with 35% deciding to open an email based on the subject line alone. It can be the first, and sometimes last, impression your company creates. The subject line is difficult to get right. After all, you need to entice the recipient into opening an email in, ideally, less than 20 characters (between 6 and 10 words) in order to avoid getting cut off on mobile devices. Personalize the subject line, include the interests of your subscribers and give them a reason to open the email. Be careful with the tone, keep it friendly and open. Use humor occasionally too. Carefully crafted and personalized subject lines can boost open rates by 22.2%. So take your time. You or your team should create a number of subject lines that fit the criteria. You need to bear in mind the content of the email and ensure the target audience will want to click in. Test the lines too. Once again, this is where segments are very useful. Split testing to a portion of your list will enable you to see which line delivers the higher email open rates. You will notice these strategies are about retention as much as trying to attract new subscribers. It is cheaper and far more efficient to hold on to your current list than trying to grow it. Also, engaging in one strategy alone will not work. For example, focusing solely on personalization will be ineffective if you have poor subject lines and vice versa. The key is to take a holistic approach – try to prioritize what your message is, target your audience and do what it takes to get your email opened, time and time again. Manage the expectations of your subscribers. Over-promising leads to disappointment so deliver what they expect, which are great emails with great content that is relevant to them.